You may ask yourself why I would choose a book about painting. When it comes to color any resource material is important. I continue to stress in my design classes that when one works with color, whether that involves painting, dyeing, quilting and fiber art, observation skills are honed, vocabularies are enhanced and a deeper understanding is gained. It is never just about using color in your chosen medium. By exploring how color proportions are introduced one understands how color can touch the emotions. We can read all about color in the encyclopedia, on wiki and most design books briefly touch on the subject. To really comprehend and internalize color we must immerse ourselves in its study. 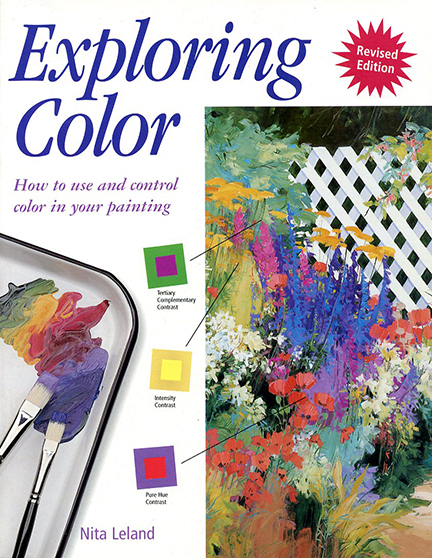 I am not a painter, yet this book has guided me along the path of gaining better insight into the principles of color. When we are bombarded with terms like analogous, triadic, monochromatic, achromatic, complementary, split complementary, double split complementary, warm and cool color schemes, value, hue, contrast and taking risks with contrast we often feel overwhelmed. Our natural reaction is to put off researching the terms and the next time we are confronted with them we feel a pang of inadequacy and wish we had a way to educate ourselves better to be able to contribute to a discussion. Nita Leland’s book can provide you with a better insight of how color works and why one color scheme is more successful over another. It teaches about taking risks when combining colors and with 87 exercises provides a course you can follow in your own home. All you need are some basic water colors, paper and a couple of brushes. From pure color to mixing the rainbow – color theory is explained with down to earth vocabulary, and composition principles are easy to comprehend. The next time you venture out to a judged quilt show, an art exhibition or overhear a conversation about color and art at a gathering you can contribute to the conversation with confidence, raise questions and no longer feel that you must find a place where you can take a class about color! 28 Feb	This entry was published on February 28, 2013 at 9:12 am. It’s filed under Art, Book Review, Creativity Update, Design and tagged Color scheme, color theory, Color wheel, Exploring Color, Fiber art, Nita Leland, taking the fear out of color therory, understanding color. Bookmark the permalink. Follow any comments here with the RSS feed for this post. Older: Up for a Lesson in Design? Intuition is great when it comes to choosing colors – the issues arise when we teach, jury or judge art and quilts. To provide constructive feedback one has to be able to use proper design and color vocabulary. About Kantha – it does not have to be all even! It is handwork after all (worked without a hoop) and the undulating lines of repeated running stitches create a lively dimensional background. Hope this helps!